After reading it I went beck to Martin Fowler’s excellent The Design Stamina Hypothesis. 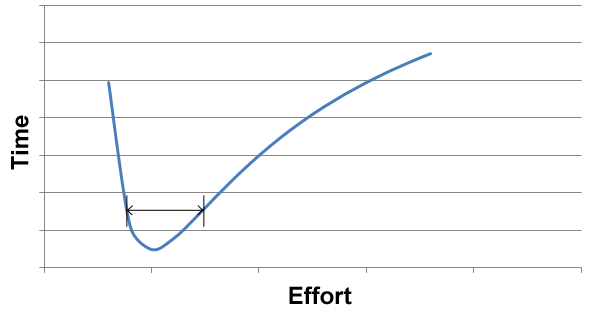 Design-wise, I wonder how your ‘optimal amount of effort’ relates to the design stamina of the project? Is the optimal amount of design effort the amount that gives you the greatest stamina, i.e. allows the project to go as fast as possible for the longest amount of time? Thanks for the link, Philip – hadn’t seen that before. Interesting stuff. Definitely seems like a similar idea. I’d definitely agree with Martin’s idea that the line is much lower than people think – certainly weeks, if not days in some cases. I think that’s the real challenge in balancing the effort you spend – you need to put in more than you think or you incur the cost sooner than you think. Excellent title for a good post! The only thing is that I don’t really understand your diagrams (I must be too dumb). Thanks! Glad you liked it. And absolutely understand on the diagrams, I’d hoped they would help but… in hindsight not sure they make it clearer! All I was trying to say is that to complete some given task there’s an optimum amount of effort to spend. In trying to get things done quicker, we put in less effort so the task takes longer. Often, I believe, by putting in more effort – i.e. more talking to people, more up front thought – we’d actually get done quicker overall. And Pascal probably ripped it from Cicero. As I said, irrelevant nitpicking. Haha glad you liked it – thanks! Wasn’t entirely sure where that quote came from, so interesting to know that it came from even further back than I’d thought. Cheers! Experience plays a huge role in this as well. I used to have a coach who said “Practice doesn’t make perfect, perfect practice makes perfect” (I’m sure he ripped that off from someone, although I have no idea who). I’m a fairly young developer and I struggled a lot getting out of the gate and made a ton of bad design choices. Luckily for me I work at a place where I’m very rarely rushed, so I have time to go back over my decisions and refactor and improve and learn. If we keep rushing developers they won’t get the experience needed by applying the more elegant and simplistic designs. That’s a really interesting point – it’s easy to forget that much of the learning in this job is done while delivering; if that delivery is always under pressure there’s no room for mistakes and no chance to experiment and learn. Great read, couldn’t agree more. Subscribing hoping for many more, keep up the good work. Thanks for the article. I’m not sure that “effort” is clear — do you mean effort towards project organization and team communications, or effort towards Making Stuff Work[tm] (coding). I think it’s the former, but not sure, because wherever you spend your time is “effort”. Yeah I couldn’t find a good word so used effort as it was the closest I could find. I really mean “energy directed at completing a task” (so the latter, really – although it could equally apply to out-of-band stuff like organisation, I guess). Good programmers are lazy, so will always look to spend the minimum amount of energy possible to complete a task; but sometimes that means we optimise too early – we put in less energy but end up taking longer. Maybe effort was the wrong word – if you can think of a better one let me know!! I don’t really get the graphs. 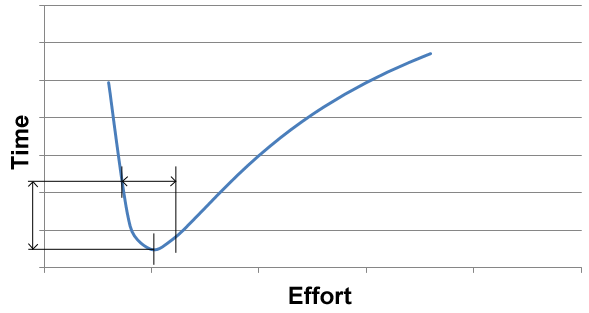 How does it make sense to chart time against effort. in programming Isn’t the best way of measuring effort precisely to measure the time an activity takes. for example, working for two hours takes more effort than working for one hour. I don’t grasp in the charts how effort can actually go down as time increases. I guess what I’m trying to get at is that effort (or energy expended) is the controllable variable; time is implied by the system. So I get to decide whether I do a massive design up front and try and think through every possible case (so expend a great deal of effort, all the way to the right on the graph); or I might decide to do no design, not talk to stakeholders, not plan any testing, not write any unit tests and just hack until it vaguely looks like it might work. That’s probably far to the left on the graph. My point is that we get to control the amount of effort or energy we spend in aiming to complete a task, and sometimes doing *more work* will get the task done quicker. Hmm, not really sure now. Must’ve made sense at the time!